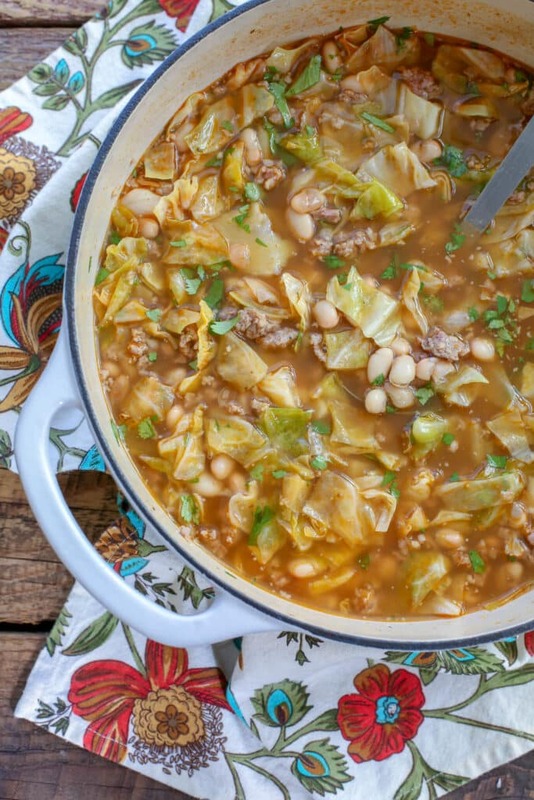 Spicy sausage, tender white beans, fresh cabbage, hearty broth, and plenty of Mexican spices come together in this delicious cabbage soup recipe that your whole family is going to love. I’ve partnered with Zoup! to share this recipe with you today. They provided me with a selection of their broths for recipe development, as well as compensation for my time. As always, all thoughts and opinions are my own. As the weather here in Arizona is finally cooling off, I’ve been craving warm bowls of soup. 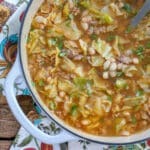 We love cabbage soup and pretty much any recipe that includes cabbage is certain to be a hit with my crew. 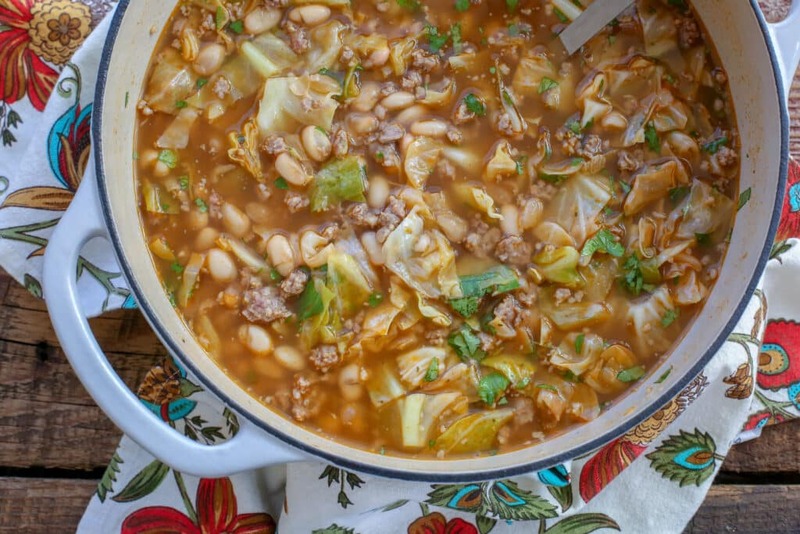 This Mexican White Bean and Cabbage Soup combines the ingredients we already love and gives them an extra hit of flavor and heat with an abundance of spices, along with hot sausage, and a really tasty broth base for the soup. Zoup! started out as restaurant chain and customers often commented on how much better the chicken broth in their soups tasted compared to grocery store chicken broth. This inspired the Zoup! team to create a retail broth on par with the broths used in their restaurants. Today, these premium broths are sold in grocery stores across the country. Zoup! 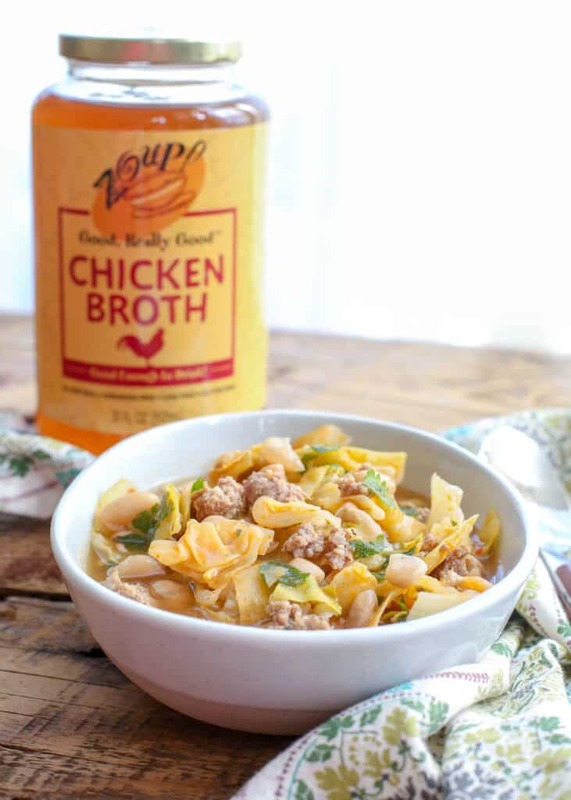 Good, Really Good™ Chicken Broth is great in this soup, however, it is also delicious with the Beef Bone Broth. Zoup! Good, Really Good™ Broths are cooked in small batches, for a true homemade flavor, and they’re also low-calorie, paleo-friendly, gluten and fat-free, as well as free of GMOs and any hormones. You can find these products at Albertsons-Safeway, or Wegman’s. You can also visit Zoup! online at their website (you’ll find a coupon at that link! ), or on Facebook, Instagram, and Twitter. 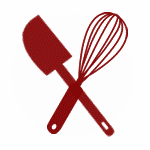 For further questions, you can contact them directly at info@zoupbroth.com. 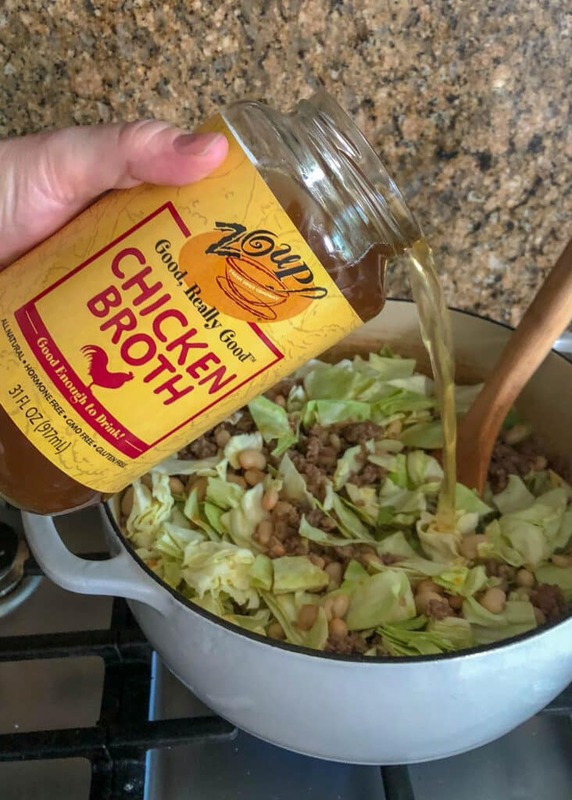 For more great recipes that can be made with these broths, check out this Chinese Beef and Broccoli Soup, Egg Drop Soup, Chicken Tortilla Soup, and Philly Cheesesteak Stew. And last but not least, our long-time favorite Hearty Italian Vegetable Soup. We keep this vegetable soup in the freezer year round for easy lunches. In a large pot, over medium-high heat, cook and crumble the sausage. Sprinkle with Mexican spices as it cooks. Add the cabbage, white beans, chicken broth, salt, and cumin. Stir to combine and bring to a boil. Reduce to a simmer for about 5 minutes, until the cabbage is bright green and slightly tender. Taste and adjust salt as desired. Remove from the heat, add cilantro, and stir once more. Scoop into bowls and garnish with additional cilantro, if desired. 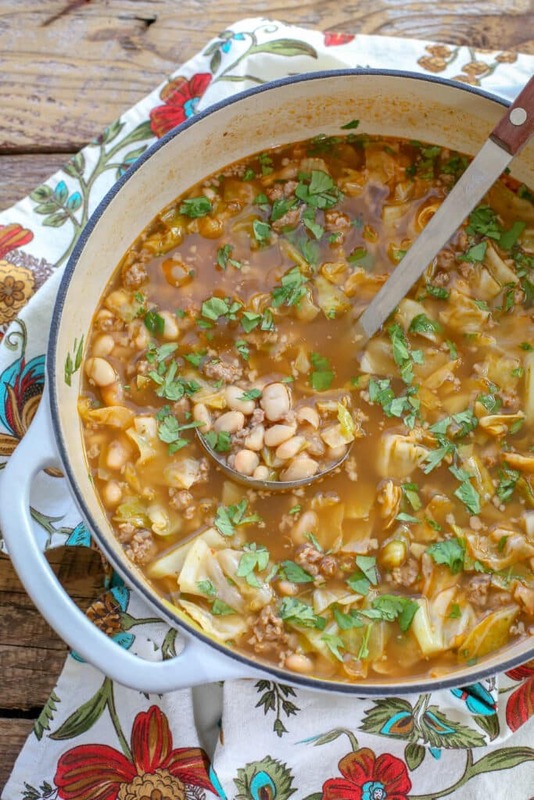 Spicy sausage, tender white beans, fresh cabbage, hearty broth, and plenty of Mexican spices come together in this delicious cabbage soup recipe. Remove from the heat, add cilantro, and stir once more. Scoop into bowls and garnish with additional cilantro, if desired. Enjoy! What kind of white beans - Great Northern, cannellini...? And regular pork sausage? I typically use white beans, but cannellini work as well. Regular pork sausage or hot sausage will both work for this recipe. 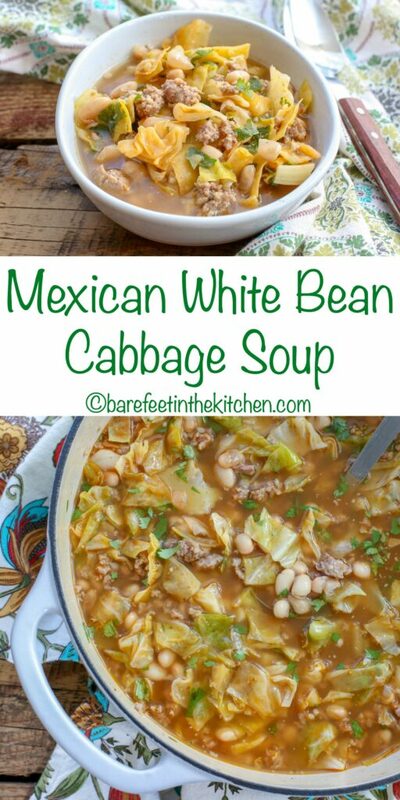 Now this white bean and cabbage soup looks GREAT!